In response to recent weather warnings which are predicted to reach all areas this week, our Care and Repair team are proactively contacting our elderly clients to ensure that they are safe, warm and well during this current cold spell. 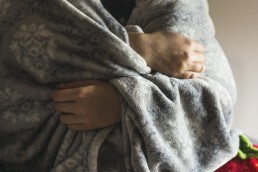 If you know of any older people who you feel may be alone, vulnerable or in need during these extreme cold conditions, please call or visit them so that they have peace of mind and know they are not alone. Should you wish to contact our Care and Repair service, please phone 059-9720733 for further advice. It was a momentous day for Hacketstown on Friday 23rd February as its new Community CORE was officially opened. This represents a huge achievement for the members of Hacketstown Community Development Association who are eager and enthusiastic about the CORE. The CORE building (situated in the old CRISP centre) has recently been donated to the community of Hacketstown by Carlow County Council. Hacketstown Community CORE will be a focal point for educational and recreational courses for the entire community in Hacketstown. The community hub will also act as an information point and drop-in centre as well as a meeting place for all age groups. Senator Jennifer Murnane O’Connor, Councilors John Pender and Andrea Dalton, alongside representatives from Carlow County Development Partnership CLG, Carlow Volunteer Centre, Carlow PPN (Public Participation Network), St Catherine’s Community Services Centre, KCETB, and many more were present. Speaking at the opening, CEO of Carlow County Development Partnership Mary Walsh highlighted several streams of funding and services that will be forthcoming through LEADER, SICAP and the Tús scheme, which has already been operational in Hacketstown for the past five years. Mary also paid particular tribute to the Tús workers who assisted with the refurbishment of the centre and getting the CORE building ready for the opening day. Chairperson of Hacketstown Community Development Association Mary Doyle was enthusiastic in her vision for the centre, "The Core means 'the centre, the place to go to'. This is a huge achievement for the members of our Hacketstown Community Group and will act as an information point and drop-in centre as well as a meeting place for all age groups". Over the next few months, Carlow County Development Partnership will offer programs such as Online Safety, Nutrition Workshops, Yoga, Mindfulness, Safe Pass, Manual Handling, First Aid, Computer Training and many more. The CORE will also be central to the Care and Repair scheme, of which there are currently 21 members catering to the home and social needs of the elderly in the Hacketstown area. 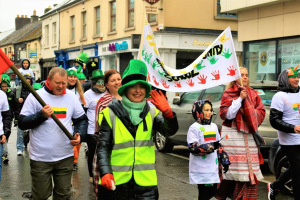 We have supported the Lithuanian community over the past few years in capacity building events around maintaining their own culture, and through funding towards the Lithuanian preschool premises and also through our support in the SICAP Programme for the Carlow Integration Forum and its events. The chairperson of the Forum is a Lithuanian National, Sandra Kazlauskaite, who has been involved in numerous programme with us over the years, included the holistic Body Mind and Soul Programme as well as in her role as co-ordinator of Failte Isteach – a community based volunteer language and welcome programme which we also fund. We wish to continue and develop this support for the community going forward beyond or support for the pre-school, and this support will begin with two small school-based projects over the next few months. 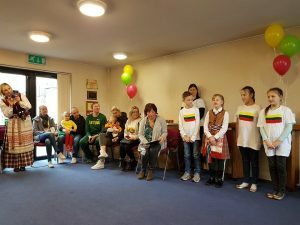 Firstly, to celebrate the important year of the centenary of regaining Lithuanian statehood in 1918, we are going to organize and sponsor a prize in one of the schools in Carlow town for the best project by a child which focuses on Lithuanian history or culture. We will aim this at children aged around 10, and hope that the Ambassador himself, or someone from the Embassy staff will help us to select the winner. Secondly, we are going to link a class from a Carlow National School – over the internet – with a school in Lithuania, maybe to develop a common project on the different cultures. Once again the Ambassador agreed to help us identify an appropriate school in Lithuania. 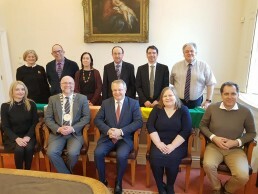 The meeting also discussed the psychological challenges around young people developing their identity between two cultures and explored possible research ideas between the University in Lithuania and Carlow College. Overall, a very positive exchange of ideas and energy. County Carlow is made up of diverse and multi-cultural communities with people from a whole host of different backgrounds with unique characteristics and experiences. 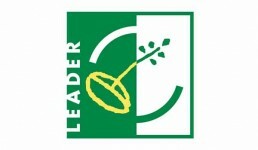 The SICAP Programme is underpinned by a Equality Horizontal theme which seeks to ensure that every individual in the county is treated fairly and equally and no less favourably, specific to their needs, including in areas of race, gender, disability, religion or belief, sexual orientation and age. This equality work refers to that work which can be described as having outcomes which promote a more equal society in Carlow. In line with the objective of this horizontal theme, in 2017 the SICAP team began work with the LGBTIQ community in the county, following representations from Carlow Regional Youth Services who identified a need for LGBTIQ support for adults in Carlow. As part a €100,000 application for Healthy Ireland Funding which was drawn up by a team of relevant agencies on behalf of the LCDC and which saw 6 actions approved, €12,000 was sourced to conduct research on the needs of the LGBTIQ community in Carlow. 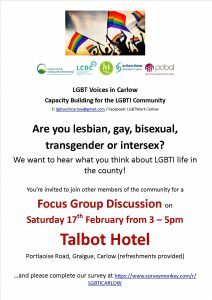 As part of this research a first FOCUS GROUP discussion will take place on Saturday in the Talbot Hotel. This will inform the work of seeing what supports can be put in place in the county. Please spread the news to anyone who may be interested.